Four Different Types of Back Massages: Kneading, Tapping, Knead Up/Down, and Shiatsu. 28 Different Types of Massage Techniques: e.g. upper shoulder press massage, shoulder blade massage, side knead, twist massage, etc. 18 Automated Programs: e.g. rejuvenate course, whole body stretch, etc. Adjustability: 12 levels of strength. 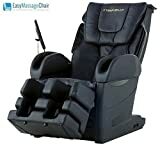 Fuji Medical EC-3800 Cyber Relax Medical Massage Chair - Black out of 5 based on ratings.